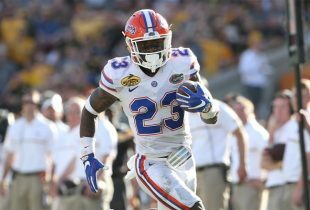 1 » Former Florida Gators safety Major Wright remains unsigned with the Chicago Bears, but that is not too uncommon considering training camp is still a ways away. However, what is interesting is that, according to the Chicago Tribune, the Bears will be including a “one-timer” (something generally used for second-round picks) in Wright’s contract. Essentially, Wright will earn an additional guaranteed incentive in the final year of his rookie contract (2013) as long as he actually steps on the field as a safety (rather than just a special teams player) at some point during his first three seasons. 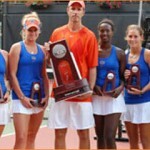 2 » Competing in the 2010 NCAA Championship Round of 16 on Thursday against the Ole Miss Rebels (17-6), No. 3 Gators women’s tennis (27-2) captured a 4-1 victory and advanced to the quarterfinals of the tournament at the Dan Magill Tennis Complex in Athens, GA. The No. 5 doubles pairing of senior Marrit Boonstra and freshman Allie Will took an 8-6 victory while No. 8 Will and No. 9 Lauren Embree (also a freshman) each won their singles contests. Florida will square-off against No. 11-seed Miami (FL) in the next round on Saturday at 1 p.m.
4 » It is a busy week for Florida’s athletic department as the No. 4/6 men’s golf team is also currently competing nationally, playing in the first round of the 2010 NCAA Central Regional on Thursday. In second place after posting a team score of 279 (-1), the Gators are only behind the leader, Stanford, by two strokes. The event continues Friday.